Do you ever wonder if there’s a soul link between you and your pet? What if they could talk? What would they say? Do you ever pray that when your pet dies it isn’t the end for them and that one day, somehow, you’ll see them again? Do you believe that your pets go to heaven? 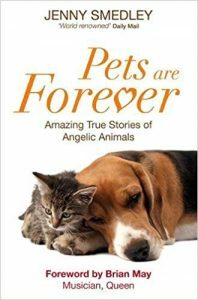 In this book Jenny Smedley explores the many spiritual aspects of animals, with tips on how to achieve closer communication with your pet, stories of pets that have returned after death or been imbued with divine grace. Pets Are Forever helps to bring the animals and the humans on this planet together in unity, and gives comfort to those grieving for a lost pet, by showing us that they are never really lost at all.